Edited and written by world authorities, this text encompasses all aspects of Hodgkin's disease, non-Hodgkin's lymphomas, and related disorders. 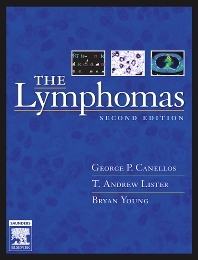 Designed to be the "Bible" for both clinicians and scientists who deal with lymphoma, the book is packed with useful summary tables and abundant illustrations and translates cutting-edge discoveries into state-of-the-art management guidelines. The preeminent names in research and practice bring together today's entire spectrum of knowledge--from epidemiology, classification and prognosis through diagnosis and therapy, including the latest scientific advances, such as the impact of molecular biologic and genetic discoveries and new biologic markers. Covers molecular biology bone marrow transplantationlymphoma in AIDS and Hodgkins disease. Provides in-depth coverage of the underlying biology of the disease as well as etiology, pathology, diagnosis, and treatment. Discusses advances in the treatment of diseases including radiotherapy, radiolabeled monoclonal antibodies, treatment of cutaneous lymphoma, and metastatic disease. Contains precise clinical how-tos for managing bone marrow transplantation and diseases that resemble lymphomas.